Receiver version of the Alinco DX-SR8. These impressions are brief and straight “out of the box”. Others can do technical reviews and measurements. Specifications are available on the web – It came with everything in the box; but I would suggest collect it from the shop or have it double boxed for shipment as the box is not sufficient to protect it in the post. Easy to get going – just put on the aerial, plug in the power and press the on button. First thing I did was to turn off the “Beep” as it was annoyingly loud. Appearance is OK, case is robust but I felt the tuning knob was a little too big and protruded out the front of the set more than necessary – whats the problem? Only that as it turns with the lightest touch and the RIT knob and some of the control buttons are so close it is easy to find you have left the frequency you want. I simply put a slightly smaller knob on. Sensitivity. This was good – I was comparing it with a Palstar R30 and an Icom IC7200 (a digital processing set). It comes in on testing with weak signal ( which is just becoming readable) in a manner which seems it is equal to the Icom and betters the palstar. I have not tried the FM. Selectivity. This set basically has two levels of selectivity – wide and narrow on all modes other than FM which is fixed. The filter shape is not as steep sided as the Palstar Collins mechanical filters nor can it match the DSP set with near vertical side shape to the filters and a wide range of settable widths. Having said that, in operation the filters perform well in all but the most difficult conditions. Remember it is a general purpose receiver and not so likely to be often used to ferret out tiny signals in a competitive pile up – which most are not listened to for long anyway. Audio. Seems to have plenty of this though the internal speaker has its limitations and it is nice to use a better quality larger external speaker. However they seem to have applied a level of top cut to the audio which noticeably cuts the highs. Noise suppression. The noise blanker works on impulse noise and not much on hash. This is normal on most sets without extensive blanking circuits. However on adjacent interference you can shift the passband to help eliminate a problem. The handbook says this control does not work on AM, but mine does to some extent, particularly on the narrow filter setting. Like all new sets it will take time to get used to the layout and operation of the controls. But after a few hours it all falls into place. Setting memories takes a couple of tries to get to understand how best to do it - then it is easy. When in memory mode you can continue to tune up or down, and return to the memory by again applying the up or down button. I find that its often best to stay in memory mode, jump to the memory closest to the frequency wanted and tune the rest of the way. Also after a few tries the direct frequency entry is quick and when you understand it there are several short cuts for fast entry. 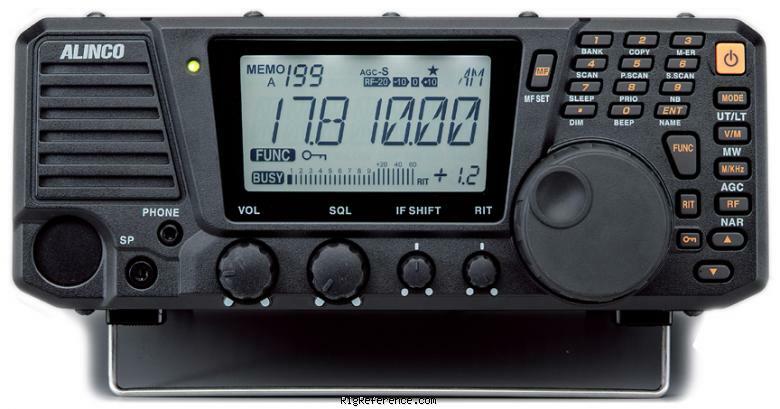 How does it compare overall – first impression is that its not as easy to use as Palstar, but has slightly better sensitivity and comes up on frequency without about 20 mins of warmup – not as many controls or adjustments as the Icom, but seems just as sensitive and has a bigger easy to read display. What didn’t I like – well not much other than the tune knob. What would I like added? As with most SWL s I would prefer to be able to truly Zero beat a station rather than the upper or lower side injection. I have not tried the scan; nor have I tried the computer control which requires a special control cable. I have tried the free software for computer control ( see Alinco website) and this looks to be an interesting way to go if you have your set near the computer – but keep your aerial well away from the comp! To avoid interference. This radio is not expensive, though it is not cheap. However it has those essential things that good and older shortwave receivers had but with today technology. To me, sensitivity is one of the most important thing a radio should have. I will do very little with an equipment that is robustly built but the rf gain is bad. And this radio is a solid performer as the Kenwood R-5000 which had excellent shortwave reception. It is also well built. For those who can not operate a radio without dsp and synchronous detection, the radio can also be used as a sdr platform and be controlled by a pc. Very Good, worth every penny. No thrills, but gets the job done. The receiver is very good with the crystal filters, it has narrow filters build in for SSB and CW wich work very well. I am using it with an Ez-Wire and it works great on all bands audio and cw. I have not tried any digital mode with it. It is and inexpensive GEM! Estimating the value of a rig can be challenging. We collect prices paid by real hams over the years to help you estimate the current value of the Alinco DX-R8. Just bought or sold this model? Let us know what you traded it for and help other ham operators!